MACUCC: Post your church's event or ad on macucc.org! MACUCC: Post your church's event or ad on macucc.org! Post your church's event or ad on macucc.org! Post your church’s event on macucc.org! Is your church having a special musical performance? A fair or rummage sale? A special worship service? Share the news with neighboring congregations by posting it on the church calendar on macucc.org. Go to the macucc.org calendar to submit your event. It will be posted once it is approved by the website moderator. Want to see what other churches are up to? 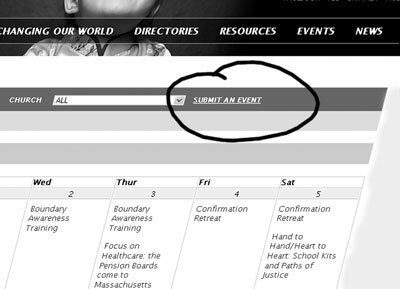 Go to events and click on "Event Type: Church" for the latest! Post your church’s ad on macucc.org! MAC’s List - the Conference version of Craigslist that was introduced on the former website, is alive and well on the new macucc.org. If your church has a position that needs to be filled, an item to sell or give away, or an item that’s needed, post your classified ad for free today at www.macucc.org/macslist.